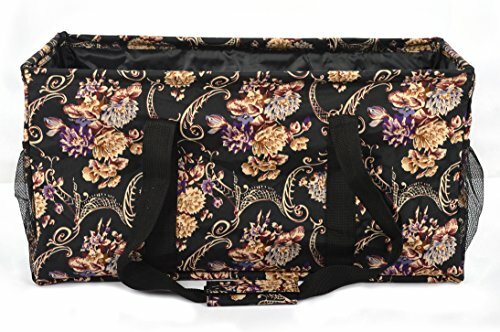 Large Collapsible Rectangle Container Utility Tote Bag comes in multiple colors and prints that fit every style and need. This roomy bag makes a perfect reusable shopping bag, household or car organizer, gift for friends and family. VERSATILE DESIGN - Excellent for grocery shopping, camping, using in a car, laundry, the beach or a picnic. Also can be used as an overnight bag, gym bag, house organizer, or swim bag. DURABLE AND STURDY CONSTRUCTION - Made with water-resistant nylon material that is easy to clean. Collapsible wire frames on the sides and the top frame together hold up the bag and keep it at a rectangular shape when in use. Plastic bottom helps to keep the shape when filled with items. Strong nylon straps that wrap around the bottom of the basket help secure a bag full of groceries. If you have any questions about this product by CAARIBUK, contact us by completing and submitting the form below. If you are looking for a specif part number, please include it with your message.